¶ 1 Leave a comment on paragraph 1 0 Leland Axelson, NCFR’s 31st President, was a long-time member and will be remembered for his untiring efforts to increase NCFR’s membership rolls and services to practitioners. 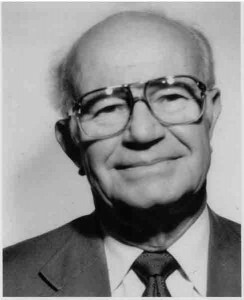 He was appointed by Gerald Leslie, 1971 President, to do the first “self-study” of NCFR’s membership needs. As a result of his findings, NCFR underwent some restructuring. ¶ 2 Leave a comment on paragraph 2 0 Axelson was a leader in recruiting racial/ethnic minority members to NCFR and encouraging them to fill leadership positions. He was also very interested in defining the discipline of “family studies” and in collaborating with other related professional organizations. ¶ 3 Leave a comment on paragraph 3 0 As President, Axelson spearheaded one of the most successful Annual Conferences, jointly sponsored with the American Association of Marriage and Family Therapists, in St. Louis, MO. Attendance broke a record: 1,700, which still stands as the largest gathering. He advanced the family policy roles of NCFR working closely with then-Sen. Walter F. Mondale (D-MN) on the Child and Family Services Act.” He was also very supportive of the state Affiliated Councils and served in a variety of leadership roles in the Southeastern Councils. ¶ 4 Leave a comment on paragraph 4 0 Though he began his career as a high school teacher, he soon earned postgraduate degrees. He taught at Florida State University, and Colorado State University, and then became a professor in the Department. of Family and Child Development at Virginia Tech University, from which he retired. In retirement he was active in community affairs and volunteer activities. He and his wife, Julein, often attended NCFR conferences. ¶ 5 Leave a comment on paragraph 5 0 Axelson passed away at age 85 in Blacksburg on May 6, 2010. He is survived by wife of 61 years, Julein, and their children, Andrea, Marta, and Paul, and their families. ¶ 7 Leave a comment on paragraph 7 0 We are a young discipline, an unproven neophyte with unknown status among the other disciplines concerned with human problems. This basic fact often makes it difficult to attract the most or more competent student, one who seems to show promise in the area of inquiry. Indeed, we should be seeking students who tend to be independent or willing to suffer the stings of criticism for traveling unmarked paths and byways, and willing to work lonely hours to fulfill the promise of the study of the family.